Embroidery on bag is available in Hebrew or English. 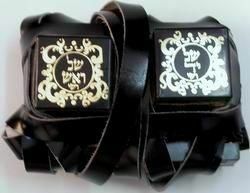 Fine Quality Set of Tefillin, adult size. Comes with Covers and matching Velvet Tefillin bag to keep tefillin safe. Mehudar. High Quality Parshiot (Scrolls). Guaranteed Kosher. Excellent gift for Bar Mitzvah. The Tefillin Set is made from thin hide which was softened, stretched and pressed into the shape of Tefillin. If embroidery of Hebrew or English name on the bag is desired it can be added for $15. Please write name in the text box at checkout. Important to know: If you are right-handed you wear the Tefillin on the left arm whereas if you are left-handed you wear the Tefillin on the right arm.